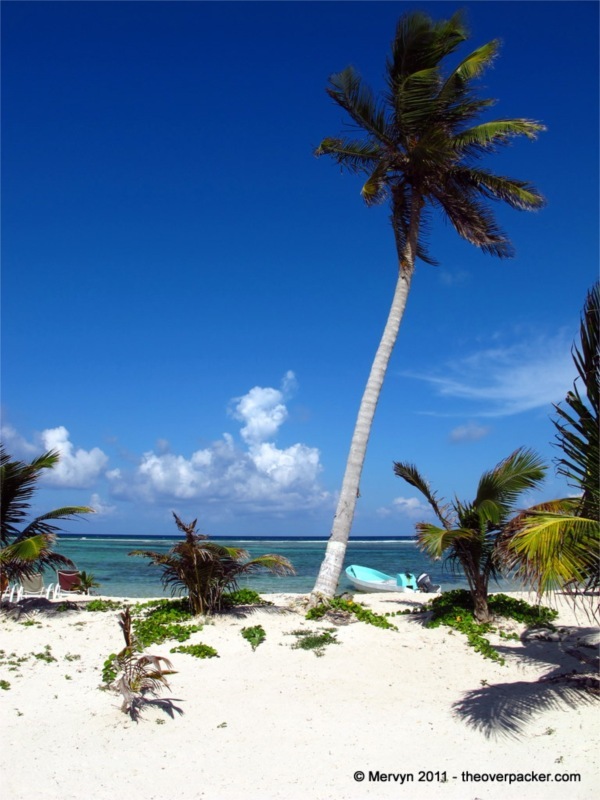 · Bus from Valladolid to Tulum (2 hours): The trip from Yucatan to the neighboring state of Quintana Roo is all tropical—outside the bus. Inside, though, is like being a Freeze Pop that’s traveling in an ice cream truck in Antarctica. One girl wraps herself in a blanket and wears a hat. I shipped all my winter gear home after Patagonia. I’m wearing flip flops. I wonder what it would be like to die of hypothermia in the Caribbean. 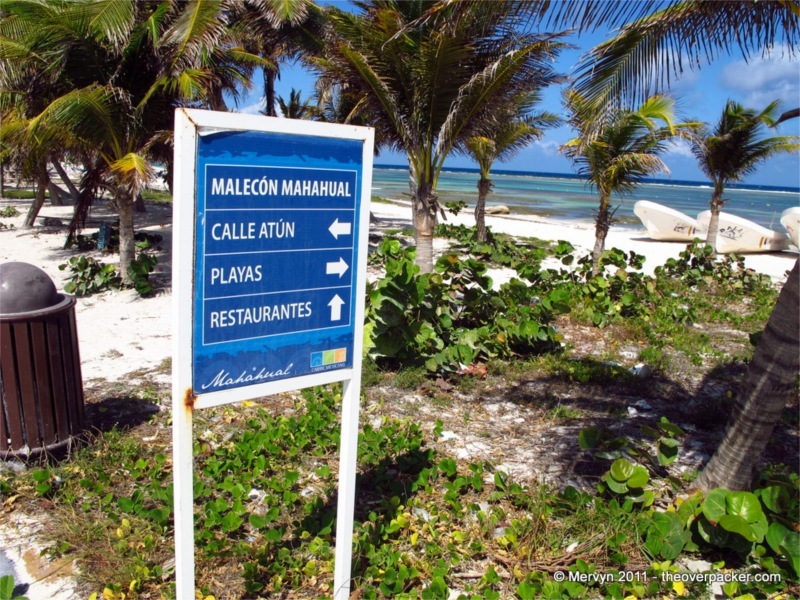 · Waiting room in Tulum (1 hour): I arrive in the small town of Tulum and discover there is no direct bus to Mahahual. I buy a ticket to Limones, a small town to its north. ”There should be a colectivo you can catch to Mahahual from there.” And we should have world peace and every little girl should own a pony. I try to remain optimistic. In the hour waiting for my bus, a cute Mexican girl flirts with me. This should be flattering except she’s four years old. She keeps edging towards me on the metal bench and pinching me. When I ask in Spanish what she’s doing, she smiles like I should know. I am frightened. We have a conversation about a spider, which is what she calls her hand. It is good language practice. She keeps making her spider crawl on my shoulder. In my head I practice more Spanish, “No, officer. It’s not what you think; she keeps touching me.” The little girl strokes my arm and smiles. I pray silently in English that she’s not making me look felonious. · Bus from Tulum to Limones (3 hours): Two hours in, I realize that I should have bought more than a packet of cookies in the Tulum bus station. I try to sleep away my hunger. This bus has no air conditioning. It’s blazing. At least, on this bus, I will die a climate appropriate death. I am, however, spared, though I sweat a lot. 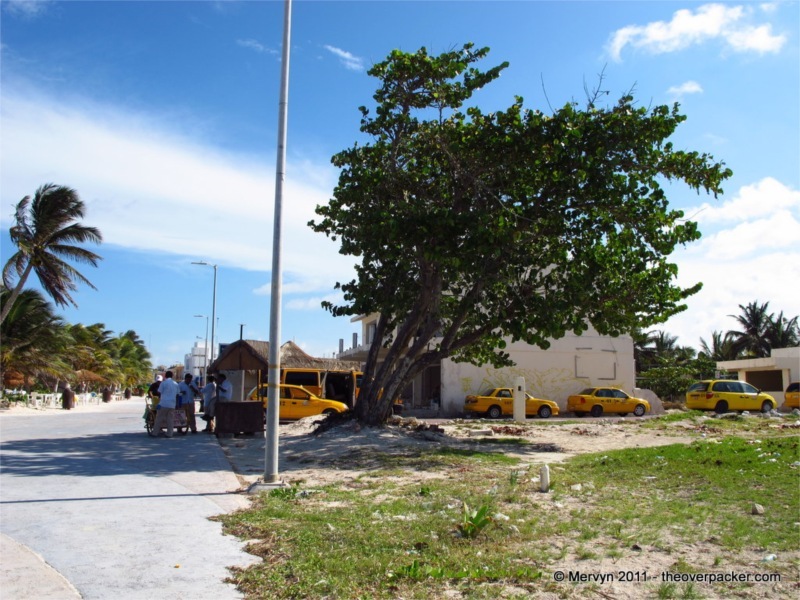 · Taxi from Limones to Mahahual (1 hour): The bus stops in front of a dusty convenience store on a nearly deserted road in Limones. There is no colectivo to Mahahual. Correction. There is no colectivo for the next four hours. A taxi driver offers his services for $20 USD. Too rich for my blood. I tell him I’ll wait for the colectivo. A father and son offer to split the cab with me if I pay $10 USD. I tell him that it should be three-way split for $7 USD a piece. “He’s my son,” says the father. I look confused. “Yes, he is his son,” says an old man selling popsicles out of a pushcart. “But your son is a person, no?” I say. The father and taxista talk for a bit and, in the end, I pay $8. There is no air conditioner. We keep the windows down and let the heavy Caribbean air whip around the cabin. We’re forced to stop at a police checkpoint. They have assault rifles. They wave us through. 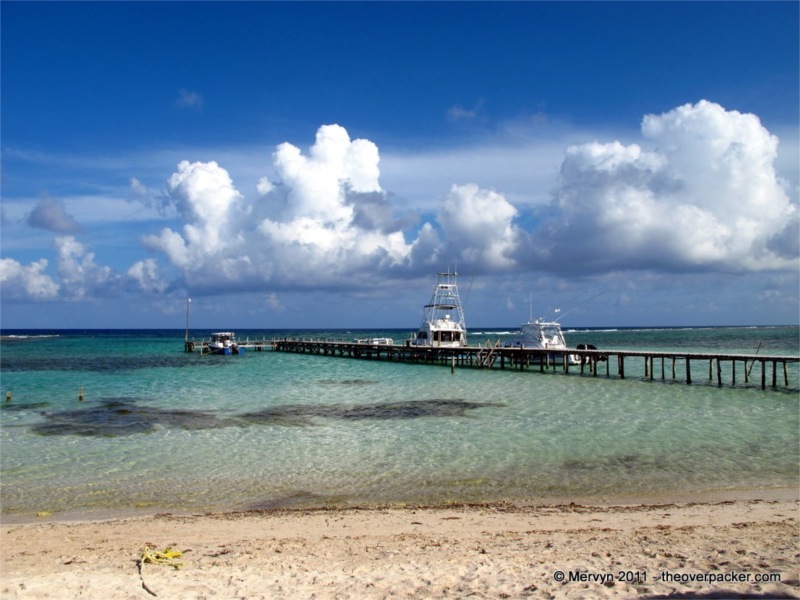 We arrive in Mahahual, a strip of town two streets wide that used to be a fishing village. The driver drops off the father and son and takes me to the southern edge of the malecón (promenade) and the town’s cheapest/only hostel. After picking out my dorm bed, I walk the length of the concrete, beachside malecón and discover there is another way to get to Mahahual. 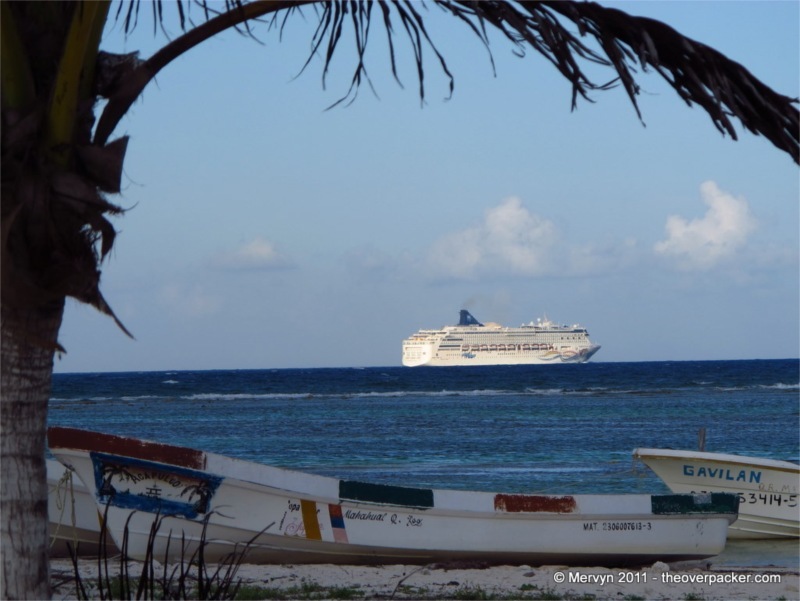 At a giant dock north of town sits a giant cruise ship. It has spilled its contents out into the bars, restaurants, and lounge chairs along Mahahual’s seaside. Americans, Italians, French, Argentines, Spaniards, and more Americans. A train of tourists on ATVs rides down the dusty road south of town. A restaurant blares raggaeton. Someone orders a margarita. A sign for the malecón points to eateries, the street, and the playas, just in case you don’t notice it 30 feet away. I discover that cruise shippers are the ultimate day tripppers. The boat pulls into port pre-dawn. By mid-morning buses, vans, and cabs have deposited passengers to their day’s activities. Some lounge on the beach under umbrellas for their chairs and their drinks. 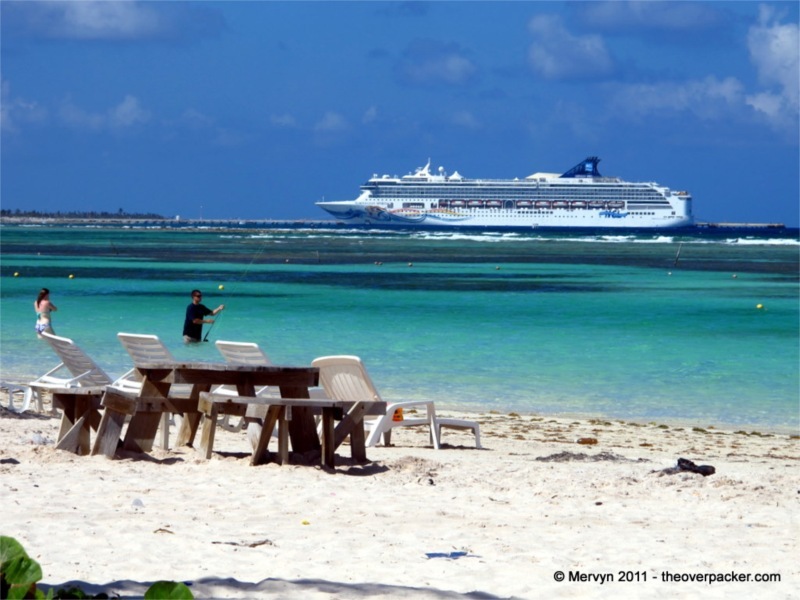 Others go horseback riding or deep sea fishing or scuba diving or ruin tours. By dinner they are all back on the ship. Before nightfall, they and their boat have left for their next exotic location. For the afternoon, though, we are all gringos. We are all tourists. 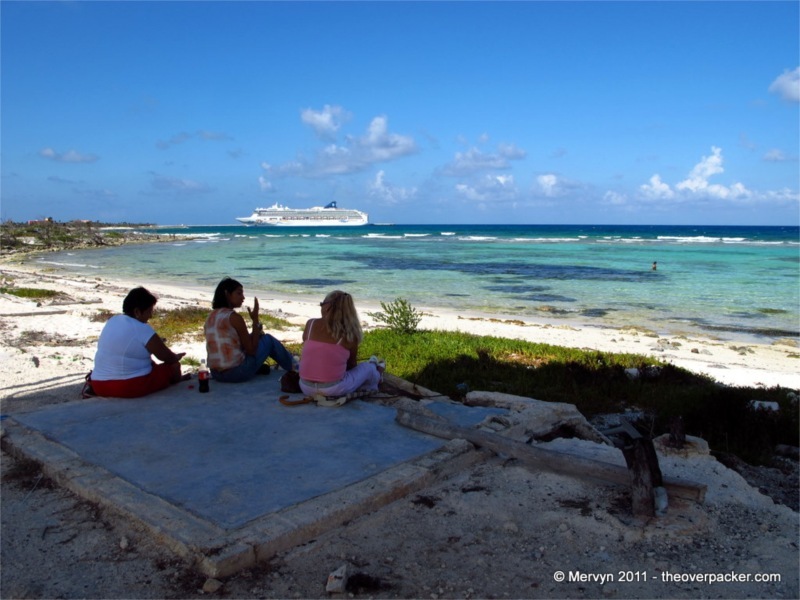 We are all welcome to Mahahual. 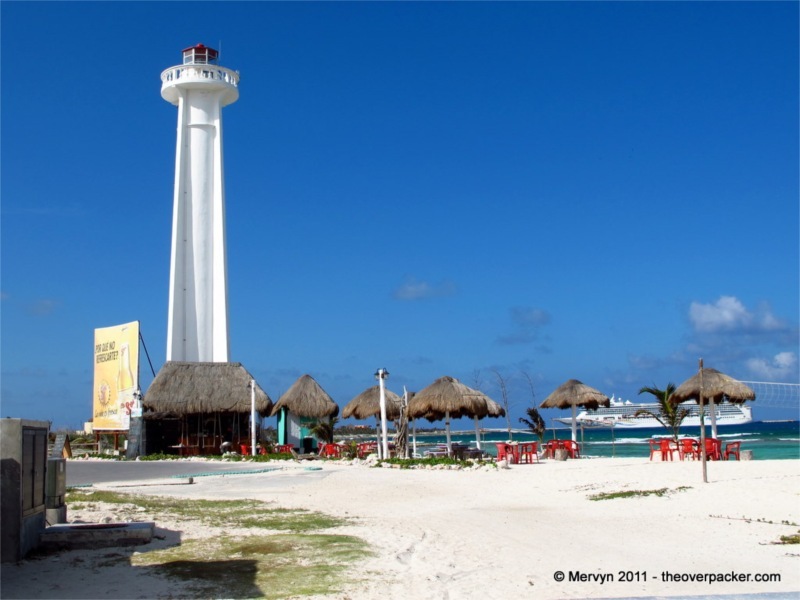 Mahahual is a front runner to host my eventual shanty by the sea. This place looks unreal. Can you share where and what bus you took from Tulum to Limones and approx cost? I’ll be making a similar trip in a few days.